Located in Evansville, Indiana, the Ford Center is a beautiful, exciting, multi-purpose 11,000-seat arena and is the region’s center for sports and entertainment. The 290,000 square foot facility is home of the NCAA Division I University of Evansville Aces Men’s basketball and the SPHL Evansville Thunderbolts. The arena floor has over 20,000 square feet of usable space and can be modified for basketball, hockey, concerts, conventions, rodeos, expos and a variety of other events. Ford Center opened in November 2011 and has drawn attendees from all over the tri-state region. It has already hosted a variety of events such as Bob Seger, Hadi Shrine Circus, Trans-Siberian Orchestra, Monster Jam, WWE Supershow and many more. Our staff is committed to providing the highest standard of service and to ensure the best possible experience during each event. 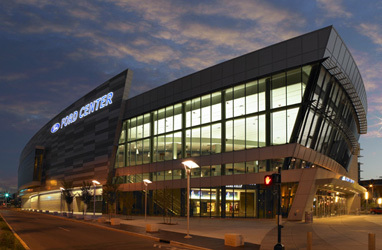 Ford Center is managed by VenuWorks, a full management service to theatres, arenas and convention centers. In addition to its facility management service, VenuWorks manages food and beverage and operations, as well as performs feasibility studies, does consulting work and provides event booking and promotion services.